Discover our different Treg cell workflows and find the one that fits your experimental needs. We offer a broad range of products for the isolation of Treg cells. 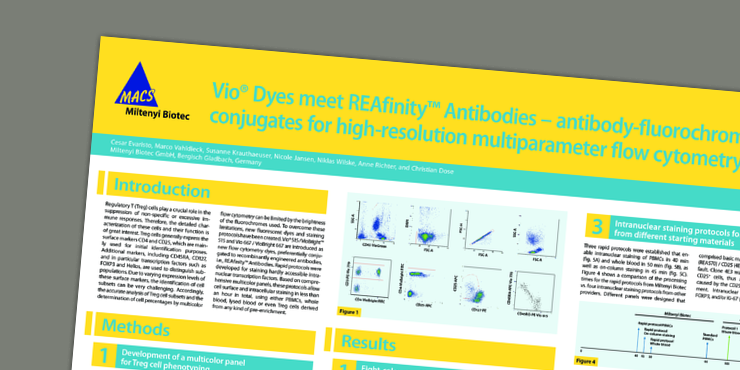 Whether you want to isolate Treg cells directly from whole blood or are interested clinical-scale CD25+ Treg cell enrichment, we provide flexible solutions for a variety of applications. 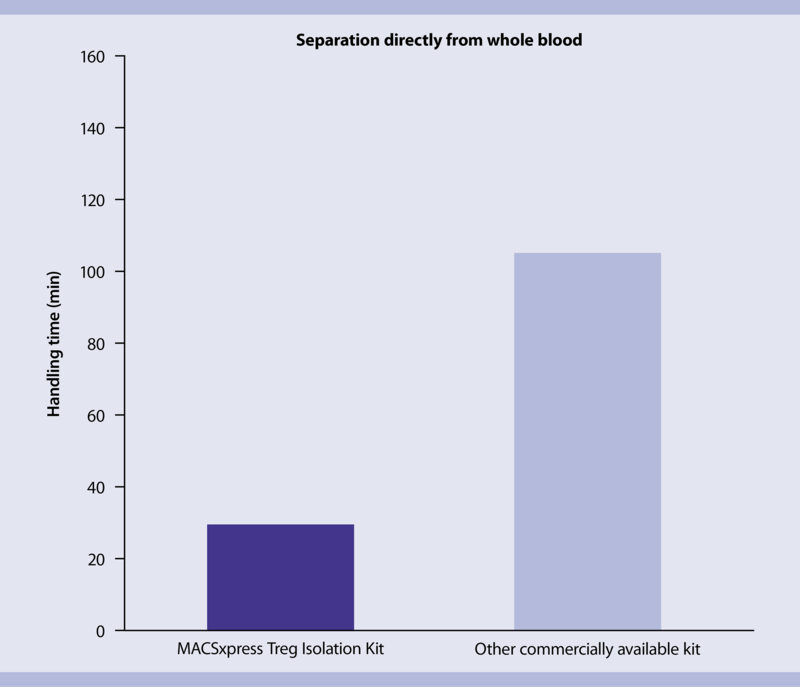 From blood collection to isolated Treg cells in only 30 min: The MACSxpress® Treg Isolation Kit, human enables fast, easy, and convenient isolation of CD4+CD25+ Treg cells from whole blood without density gradient centrifugation. 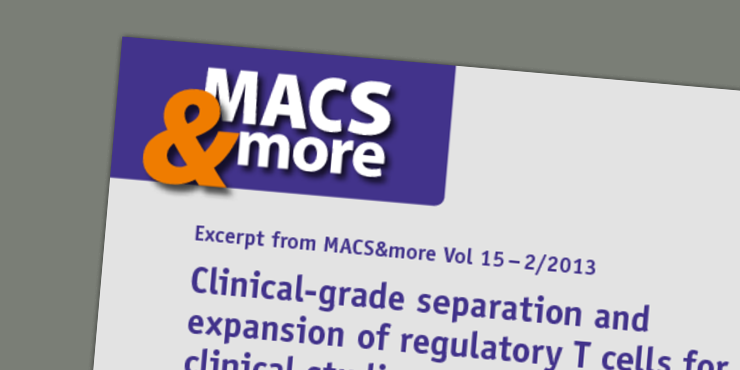 Comparison of MACSXpress Technology to another commercially available kit using magnetic cell separation to isolate Treg cells from whole blood. The result shows a reduced handling time when using the MACSXpress Treg Isolation Kit, human. Only 30 min after starting the cell separation process the enriched Treg cells are ready for functional downstream assays without any further washing/preparation steps. Staining of Treg cells with MACS GMP Fluorescent Antibodies. The Treg Expansion Kit, human and Treg Expansion Kit, mouse provide optimized stimulation conditions to expand Treg cells with maintained Treg phenotype and FoxP3 expression in vitro. Expansion of Treg cells using the Treg Expansion Kit, human. Treg cells were isolated from whole blood using the MACSxpress Treg Isolation Kit, human and expanded with the Treg Expansion Kit, human according to the protocol for 14 days. 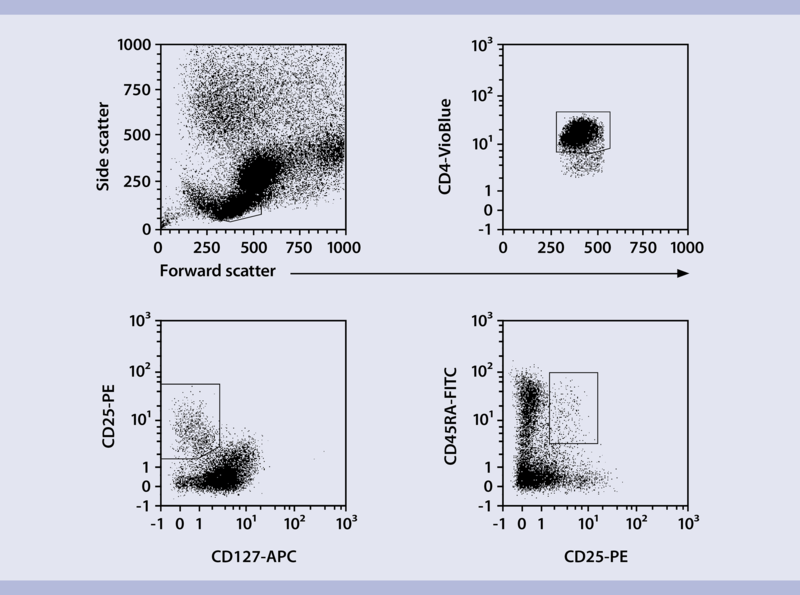 Treg cells were analyzed for their expression of FoxP3 before (A) and after (B) expansion. The MACS GMP ExpAct Treg Kit has been designed to efficiently expand Treg cells after a CliniMACS CD25 enrichment procedure, while maintaining FoxP3 expression. It can be used in combination with MACS GMP Rapamycin, which inhibits the expansion of conventional T cells and thereby enhances the proportion of expanded Treg cells in culture. The Treg Suppression Inspector, human is an optimized T cell stimulation reagent that can be used for Treg suppression assays. This cell culture tool provides convenient handling and standardized stimulation conditions for reproducible suppression assays. Treg suppression assay using the Treg Suppression Inspector, human. Treg and Tresp cells were co-cultured at different ratios in the presence or absence (no stimulation) of the Treg Suppression Inspector. Tresp cell proliferation was assessed by 3H-thymidin incorporation (left) added for 16 hours after 5 days of culture or by a cell tracker dilution (right) of the prior stained responder T cells after 5 days of co-culture. 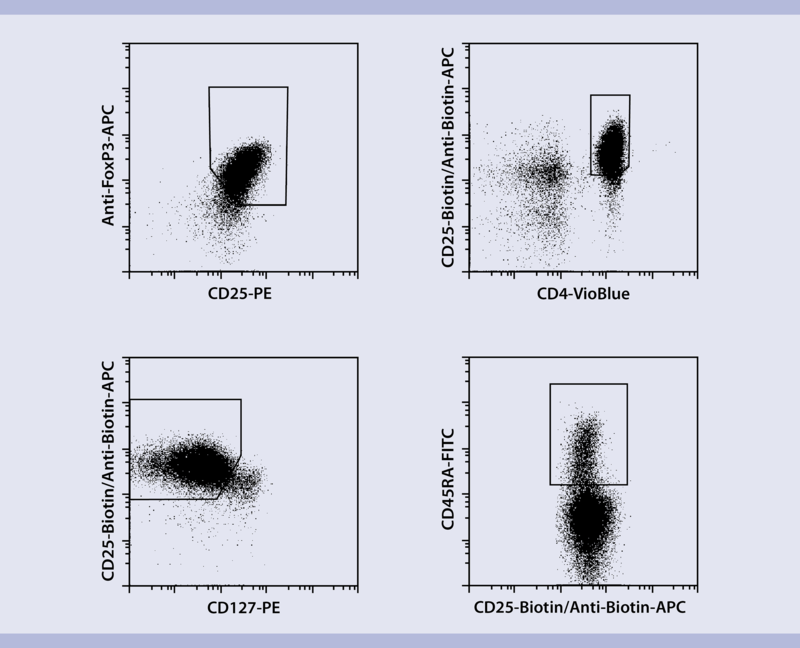 The Treg Detection Kit (CD4/CD25/FoxP3-APC or FoxP3-PE) human and mouse includes all reagents necessary for cell surface staining of CD4 and CD25, and intracellular staining of FoxP3 with a special FoxP3 Staining Buffer Set. The kit also includes FcR Blocking Reagent and an optimized protocol. Only interested in surface staining of your human Treg cells? The Treg Detection Kit (CD4/CD25/CD127) is available in 2 different color combinations. This kit is a ready-to-use cocktail, which conveniently reduces pipetting steps.